Russia has so much to offer. 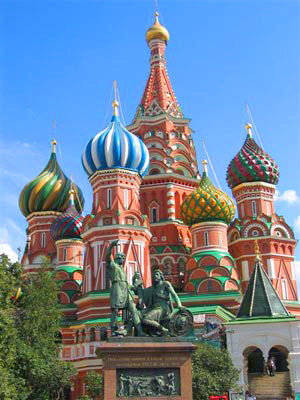 The capital and largest city of Russia, Moscow is the major political, economic, cultural and financial center. It is the site of the Kremlin, a World Heritage Site. Russia’s cultural capital. The Peter and Paul Fortress, one of the city’s oldest structures, containing the Peter and Paul Cathedral, featuring a tall golden spire, tombs of the Russian czars like Peter the Great. Tour begins at Radisson Blu Astorija Hotel, Vilnius, Lithuania. Your transfer is included from Vilnius Airport to the Radisson Blu Astorija Hotel in the heart of Vilnius’ Old Town, designated a UNESCO World Heritage Site. Join us for a welcome reception and dinner tonight. Take a walking tour of Old Town Vilnius to appreciate its remarkable Baroque architecture, the city’s 16th-century cathedral and adjacent Cathedral Square. 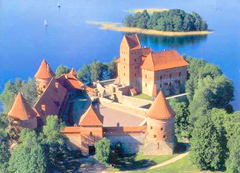 Wind your way off-the-beaten path in Trakai, a picturesque town with a castle dating to the Middle Ages; return to Vilnius to explore as you please. Depart Vilnius and journey through the pristine countryside of Lithuania; cross into Latvia and stop in seaside Jurmala on your way to the capital, Riga, an important trading center for Central and Eastern Europe from the 13th to the 15th centuries. Visit the city’s opulent 19th-century Opera House, which was painstakingly rebuilt in the 1990s and is a source of great national pride for the Latvian people. Your home for the next two nights is located in the heart of the old city. Take a drive to Riga’s Art-Nouveau New Town, considered the best in Europe, for a guided walking tour; also check out Riga Market and the cobbled streets of Old Town, revealing buildings dating back 800 years, including Riga Castle, the Swedish Gate and the Three Brothers Medieval Dwelling House. This combination of period architecture has earned Riga’s Old Town UNESCO World Heritage Site designation. Explore some of the somber reminders of the tragic years of the Holocaust at the Jewish Museum and old Jewish Cemetery. Depart Latvia and cross into Estonia this morning, stopping in seaside Parnu for lunch. Continue on to today’s final destination, the capital city of Tallinn, an outstanding example of a medieval Northern European trading center; explore the lower city on a walking tour with your local guide. 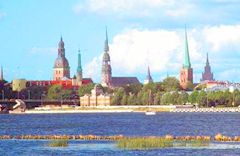 Overnight at your contemporary hotel, ideally located just minutes from Tallinn’s Old Town. Begin the day in Tallinn’s remarkably well-preserved city center, a UNESCO World Heritage Site, where you’ll visit Toompea Castle. Then board a high-speed ferry to cruise first class across the Gulf of Finland to Helsinki. Finland’s capital city is an intriguing mix of parks, waterways, and various architectural styles, which you’ll explore on a sightseeing tour. Visit the extraordinary Temppeliaukio (The Rock) Church, built into solid rock in the 1960s; see the Neo-Classical Senate Square, the green cupolas and white columns of Helsinki Cathedral, the Sibelius Monument and Finlandia Hall. 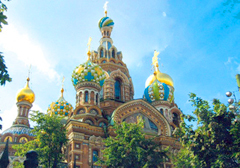 From Helsinki, your Baltics and Russia tour continues to opulent St. Petersburg via a fast train; the historic center of Peter the Great’s “Window to the West” is a UNESCO World Heritage Site. Get acquainted with Russia’s cultural capital on an orientation tour that includes the imposing Peter and Paul Fortress, among the city’s oldest structures, built in 1703. Inside the fortress, Peter and Paul Cathedral, with a tall golden spire, contains the tombs of the Russian czars, including the city’s founder Peter the Great. Your home for the next four nights is itself a historic landmark – the celebrated Grand Hotel Europe on the famous Nevsky Prospekt. 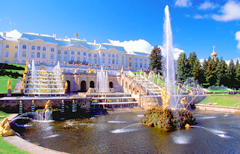 Today begins with a visit to St. Petersburg’s Grand Choral Synagogue (holidays permitting), then take an excursion to Peterhof (Petrodvorets, on the Gulf of Finland) for a tour of the summer palace of Peter the Great. A hydrofoil whisks you back to the city, where you’ll enjoy a glorious evening of Russian ballet (schedule subject to change). Journey to Pushkin (Tsarskoye Selo) for a visit to the opulent Catherine Palace, expanded by Empress Catherine the Great in the mid-18th century, and its remarkably restored Amber Room. 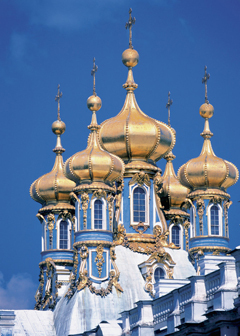 Back in St. Petersburg, take a guided tour that includes a visit to the 19th-century Church of Our Savior on Spilled Blood, built as a memorial to Czar Alexander II on the site of his 1881 assassination. Spend the rest of the day exploring more of St. Petersburg on your own. 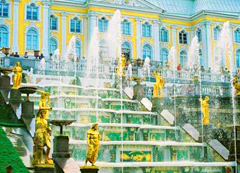 Today, visit The State Hermitage Museum, boasting one of the largest collections of art and artifacts in the world. Displays include prehistoric cultures, classical antiquities, and Western European art; you’ll view celebrated ancient gold treasures on a special visit to the Gold Room. Spend the rest of the day at your leisure, then join us this evening for a sumptuous “Tchaikovsky Night” dinner at the L’Europe restaurant – accompanied by live music and a pair of dancers from the Marinsky Theatre or a comparable local ballet company. Fly to Russia’s capital, Moscow, for a three-night stay in this ancient city. Arrive in time for lunch at the Artist’s Gallery restaurant in Old Moscow, with its elaborate, themed rooms, and visit “Apple Hall” to see a collection of over-the-top works by artist Zurab Tsereteli, housed in one of the city’s most beautiful neo-Classical buildings. Have dinner on your own in Moscow this evening. Spend the next three nights with views of the Kremlin, Red Square and iconic St. Basil’s Cathedral from your room. Begin the day by joining your local guide for a visit to the State Tretyakov Gallery/National Museum of Russian Fine Art, featuring 11th- to 20th-century paintings and sculptures by Russian artists. Have lunch on your own, then take a guided tour inside the 64-acre Kremlin, the center of Russian power for centuries and a UNESCO World Heritage Site. 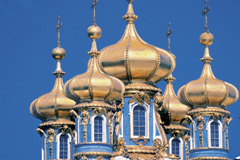 Visit the Armory Chambers, where you’ll see the treasures of the Czars, and Assumption Cathedral. You’ll have a unique opportunity this morning to meet a Kremlin insider from the Soviet era, who offers insights on Moscow’s past and how the city has adjusted to the 21st century, before you explore iconic Red Square with a local guide. Later, tour part of the Moscow Metro; with stations built of wood, bronze, copper and marble and decorated with sculptures, reliefs and mosaics, it’s as much underground art gallery as transportation system. Spend the afternoon at leisure before capping off your spectacular Baltics and Russia tour with a farewell reception and dinner this evening. Tour ends: Moscow, Russia. Your memorable Baltics and Russia tour concludes today; a transfer is included from the Hotel Baltschug Kempinski Moscow to Sheremetyevo International Airport or Moscow Domodedovo Airport.